Outset Finance is a national delivery partner of the Government’s Start-Up Loans programme so are tasked to provide finance and support for businesses up and down the country who struggle to access mainstream lending. These loans (note, they’re not grants) are provided on an unsecured basis to individuals, so there’s no need to put forward any assets or guarantors to support an application. The amount you can borrow is between £500-£25,000 per person, usually over 5 years. There are no fees involved as Outset Finance are paid by the Government and the interest rate is fixed at 6.2% APR. In these tough economic times, you’d think that not many loan applications get accepted, but in fact, Outset Finance approves 30 loans for new ideas every month, many of them for franchisees and they are looking to support even more people in 2018. To apply for a government start-up loan, applicants are sent a series of emails with prompts asking for information and documents which they upload through a cloud-based system. This means they don’t have to interrupt their normal daily schedule to complete a successful application. 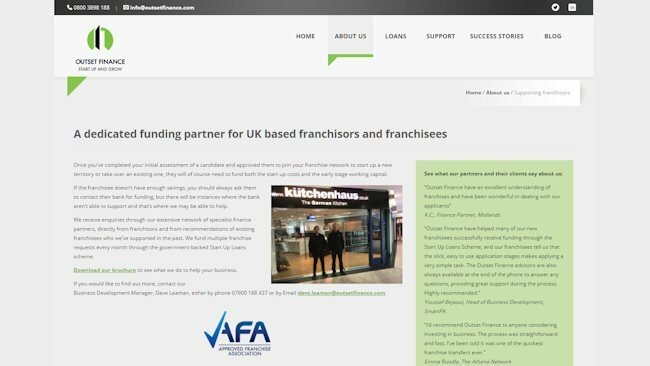 Dave Leaman, from Outset Finance said, “You will have been approved by the franchisor before you approach us to borrow. With regard to the lending applications we see, every case is unique of course. If the franchisee stops trading, the individual who took out the loan is still personally liable for the loan amount and interest, so will still need to make the payments until the loan is fully repaid. The loan is to a person, not a company so limited liability does not apply. You can register your interest at www.outsetfinance.com and then go from there. You can see more about how they support franchises on their dedicated webpage by clicking here. Alternatively, call Dave direct on 07900 168437 or click here to ping me an email and I’ll forward it on to him.